Use prior information to prognostic biomaker or not? In our recent publication in BMC bioinformatics, we acompared a great deal of feature selection methods to finding prognostic biomakers in 6 breast cancer gene expresion data. No methods show significant performacne in prediction accuracy, feature selection stability and biogical interprety, which against previeous reseach results: current network-based appraoch did not show much benift in our analysis. Meanwhile, A group from NKI also show the simliar results in PloS One. The R codes for these algorithms in our paper is availiable as request. This entry was posted in Computational Genomics, Machine Learning, Medicine Genomics and tagged biomarker, feature selection, Machine Learning, network on 2012-09-20 by Y. Cun. How to find the robust biomarkers in the genomics data are first step to personalized medicine. Here we take a short review on how machine leaning works in find biomarkers and current aproach in this area. for more interesting technology, please see the following papers. Abstract: Discovery of prognostic and diagnostic biomarker gene signatures for diseases, such as cancer, is seen as a major step towards a better personalized medicine. During the last decade various methods, mainly coming from the machine learning or statistical domain, have been proposed for that purpose. However, one important obstacle for making gene signatures a standard tool in clinical diagnosis is the typical low reproducibility of these signatures combined with the difficulty to achieve a clear biological interpretation. For that purpose in the last years there has been a growing interest in approaches that try to integrate information from molecular interaction networks. Here we review the current state of research in this field by giving an overview about so-far proposed approaches. 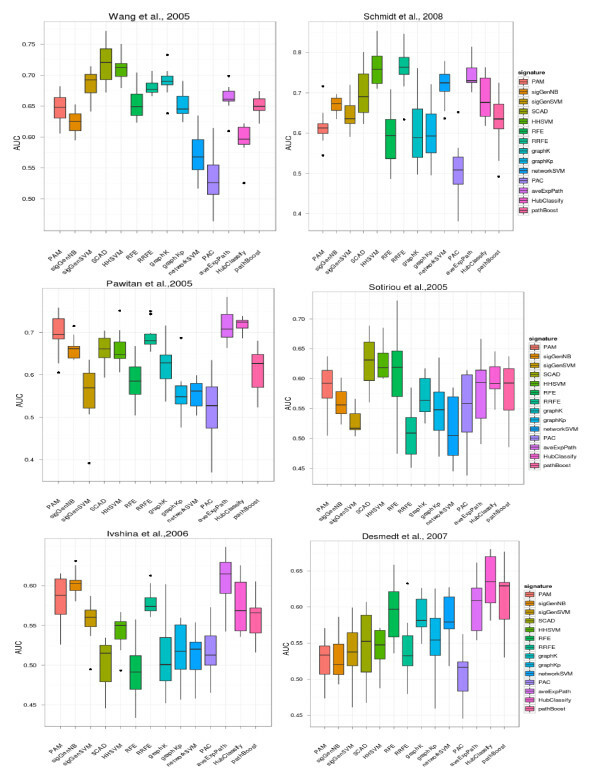 This entry was posted in Computational Genomics, Machine Learning, Medicine Genomics and tagged biomarker, feature selection, Machine Learning on 2012-03-02 by Y. Cun. A recent paper , Schwarz et al. 2010, was using kernel method to reconstruction the phylogenetic tree, which usually done by maximum likelihood estimation. Their using finite-state transducers(FST) to create a alignment-free kernel for evolutionary comparison of molecular sequence, and their call it a rational kernel approach. Their method overcome the gap in alignment sequence. As we known, the gap can influence the accuracy of phylogenetic tree. Kernel method had approved to be a powerful tool for classification, and their method do help to classify the twilight-zone in very close sequence(see the following picture). The result in their paper is a new and accurate way of determining evolutionary distances in the twilight zone of sequence alignments that is suitable for large homologies datasets. The method for phylogenetic/ phylogenomic reconstruction are still challenged problems in evolution biology. Schwarz et al. ‘s paper only do misclassification, maybe we can see the kernel method for estimating the divergence time, effective population size, recombination rate and mutation rate in nature population. This entry was posted in Computational Genomics, Machine Learning and tagged Evolutionary, kernel, Machine Learning, Phylogenetic on 2011-01-04 by Y. Cun. Information, trends, behaviors and even health states may spread between contacts in a social network, similar to disease transmission. However, a major difference is that as well as being spread infectiously, it is possible to acquire this state spontaneously. For example, you can gain knowledge of a particular piece of information either by being told about it, or by discovering it yourself. In this paper we introduce a mathematical modeling framework that allows us to compare the dynamics of these social contagions to traditional infectious diseases. We can also extract and compare the rates of spontaneous versus contagious acquisition of a behavior from longitudinal data and can use this to predict the implications for future prevalence and control strategies. As an example, we study the spread of obesity, and find that the current rate of becoming obese is about 2 per year and increases by 0.5 percentage points for each obese social contact, while the rate of recovering from obesity is 4 per year. The rates of spontaneous infection and transmission have steadily increased over time since 1970, driving the increase in obesity prevalence. Our model thus provides a quantitative way to analyze the strength and implications of social contagions. This entry was posted in Computational Genomics, Medicine Genomics, System Biology and tagged disease, Machine Learning, network on 2010-11-16 by Y. Cun. I just read a book on statistical learning, The Elements of Statistical Learning(2ed). The important of this this book do not need me buck. The authors are so kind, and server they e-print of this online freely and they set up an web for supplementary. Here is their website: http://www-stat.stanford.edu/~tibs/ElemStatLearn/ . Wish you can find the beauty of statistical learning. This entry was posted in Machine Learning and tagged Data Mining, Machine Learning, Statistical Learning on 2010-10-17 by Y. Cun.